“After The Fire”, “The Longest Night”, “Be Gone”, “Ten Years” and “Bury The Light”, albums ranging from great to brilliant. This is a chat I had with PHARAOHs guitarist Matt Johnsen when they put out “Bury The Light” earlier this year. A bit old as you understand, but Matts answers are simply too interesting to not make this available in English. First Matt, you have signed a new contract with Cruz Del Sur for another three albums. Personally I thought that “Ten Years” was to be your last for them, as this was the kind of release that bands often close a chapter with. Did you consider other options, or was it an easy decision to continue working with Enrico? Matt Johnsen: – We did, in fact, consider other labels, and were in negotiations with some that are bigger, in any meaningful sense of the word, than Cruz del Sur. But, after thinking about it in practical terms, considering the matter as a band that will never realistically be the sole source of income for any of its members, we decided that the familial vibe of Cruz del Sur, who have been with PHARAOH since the beginning, was the best situation for PHARAOH. As for “Ten Years” sounding like a closer, this was more or less accidental. It was originally intended as a supplement to “Be Gone”, but because it was released so long after that album, the implications of the EP changed entirely. We recorded all those songs at the same time as the “Be Gone” songs, though. Why did it take such a long time to get “Ten Years” out? MJ – It was a combination of things. Recording Pharaoh can be a logistical nightmare. We’re spread out across the country, and of course Pharaoh is not the “day job” for anyone, so it can be hard to get everyone’s schedule to line up for the studio. All told, we recorded 16 songs, and it took longer than we hoped. And when we run out of time to record, say, vocals, it can be months before both Tim and I are available to work on them again. That said, all the recording was done and the EP was mastered by April of 2009, but the first mastering job was not good, so we had to find another studio to remaster it. By the time that happened, the window to release it when we wanted had passed, so we had to wait again. And finally, by this point, the whole thing had dragged on so long that we had run out of enthusiasm for the effort, and critical tasks that needed to happen just… didn’t. Finally, we got it all together and released it, but it probably would have been best if this had come out one year after Be Gone, as originally planned, instead of two. “Bury The Light” is your fourth album, do you feel that you have taken steps with each release, both with regards to songwriting and production, or is there an album that you feel was weaker than its predecessor in one or both of these aspects? MJ: – To be honest, this is the first album where that evolution was not totally obvious to me. While writing the album, and while recording it, I kept asking myself, “Is this album moving PHARAOH forward?” and I could never satisfactorily answer the question. There are certainly elements that are new to us, and I think we pushed the production forward, but it would be hard to argue that this album represents as big a leap as can be clearly heard moving from “The Longest Night” to “Be Gone”. In the end, I’m satisfied that we haven’t exactly repeated ourselves, but I’m also more mindful than ever that the next album has to really push the boundaries we’ve established with our work so far. Speaking of the next album, is there new material written already? Can you say anything about the direction it takes? Have you discussed with the rest of the band how you can push those boundaries? MJ: – I have started writing new material, and as a band we’ve been talking about new modes of compositions that might push us in new directions. For instance, instead of starting with completely arranged guitar riffs, we might start by writing just chord changes and vocal melodies, leaving the riff making for later. We might try to do some very short songs (under three minutes.) We might swap riffs and arrange collaboratively. We might try to limit ourselves to, say, three guitar parts at a time (although I would try to maximize the complexity of those three parts if there weren’t going to be more layers.) I was also hoping to write with some of the crazy analog effects pedals I’ve collected over the years. But the challenge is, we want to do something new while still sounding like Pharaoh. It doesn’t make sense for a band like us to completely reinvent ourselves. We’re not Ulver, and too many of our fans wouldn’t follow a total change of course. Speaking for the material I’ve written already, the one song I’ve worked on is pretty much doom-metal tempo, although my kind of doom metal is Memento Mori, not Cathedral. In any case, there are a lot of things we can try, and even if they don’t all work, I think we’ll have the sense not to let the failures make it through to the disc! Another way to measure success, is by looking at tours, festivals, album sales (both physical copies and electronic) as well as publicity. Do you feel that each release has represented steps in the right direction with regards to this as well? MJ: – Every album has sold more than the one before it, so we do have that going for us! And we also did our first live shows after the release of “Be Gone”, with some more (finally) scheduled in the future. 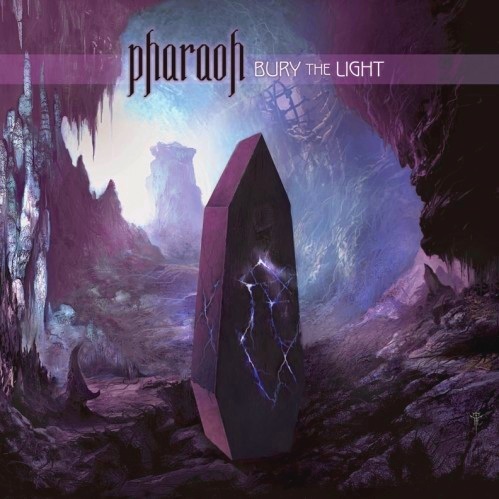 PHARAOH is definitely a growing phenomenon on the metal scene, for what that’s worth. When a band releases its debut album and also the second one, there are often high (and sometimes unrealistic) hopes of album sales and success. I guess by the fourth album you know a lot more about how far you will be able to take PHARAOH? In other words – is this it? Is this how far you can take this band? Releasing albums on a regular basis, doing an European festival once in a while, getting good reviews? MJ: – Thankfully, PHARAOH were never deceived about the career-potential of this band. Our goal from the start was to make good albums that people would like, and so far we’ve done rather well on that score. One of our only monetary goals in PHARAOH is to not lose money. We don’t need to make a lot of money, but we just don’t want the band to become some kind of drain down which dollars are poured for little return, and because we’ve been mindful of that from the beginning, we haven’t had to deal with the money-stress that destroys a lot of other bands. I have never listened to a PHARAOH-album as many times as I have with the new one, without being able to really grasp, and remember, most of the songs. It almost feels like you have put more emphasis on complexity and detail, sacrificing a bit of the hooks and strong choruses from the last two records? MJ: -This is indeed a more complex album, although we hardly intentionally sacrificed the hooks! I think it’s a catchy album, but you’re absolutely correct that it’s not as immediate as our earlier releases. But then, I would have said the exact same thing about “Be Gone”, and in fact a lot of people asked very similar questions when we did publicity for that album. I suppose time will tell if this album grows in people’s esteems in the same way “Be Gone” did. MJ: – Jim is on every one of our releases. It’s a tradition at this point. I happen to be a pretty rabid Jim Dofka fanboy, and I asked him to play on “After the Fire” because I knew he could contribute the kind of solo I could never dream of playing. It was only by accident that he ended up on the second album, when another friend of ours was unable to record a guest spot in the song “Fighting.” I had to call Jim and ask for a rush job on that one, and he brilliantly delivered. Now, as we write the albums, we’re always thinking, “What would be the best place for Jim?” and I think his solo in “The Year of the Blizzard” is probably his best for us to date. In a lot of ways, it’s atypical of his usual style – it’s played on a Strat, and is barely harmonized. It perfectly fits that song, while still sounding like Jim. It’s great. And yeah, he’s criminally unknown, but I’m doing my part to rectify that. You’d have to look long and hard for a PHARAOH interview I’ve done where I don’t go on, at length about Jim’s greatness.. As for Mike Wead, he’s just the latest participant in a second guest soloist tradition that began when I got Chris Poland to do a solo on the song “Sunrise” on “The Longest Night”. In that particular case, I wrote a riff that more or less begged for a Poland solo, so I tried to get him and succeeded. After that, we thought it would be fun to bring in other guests on all subsequent albums, both because they will obviously bring something to the table that I’m unable to produce as a guitarist, and because the challenge of acquiring their services is a thrill in itself. I had to go through a lot of Swedish connections before I was able to get in touch with Mike, but it was worth it. We have a running list of other guitarists we’d like to snare for future albums as well, but I won’t spoil the surprise by naming names. Plus, I don’t want to jinx myself, as I’ve been able to get every guest I’ve aimed for so far. I read that it took a lot of time to get this recording done, because several of the the guys involved became fathers. Did it affect the end result that the recording process was stretched more than usual? MJ: – Yeah, for instance, the drums were tracked in August of 2010, but no other recordings were even started until, I think, March or April of 2011. My own son was born in 2009, so really there are three babies to consider when scheduling PHARAOH business – mine, Chris Black’s, and Matt Crooks’s. It’s just that much harder to find the time to get to the studio, or to work on vocal melodies or solos, or what have you. It’s been a learning process for all of us. Chris in particular seems to have found a way to make it work, as he’s pretty active in at least three other bands! Heavy metal super dad. That said, every PHARAOH album takes a long time to record. That’s just how it goes. We don’t rehearse, we rarely have the song even finished by the time drum sessions roll around, and we all live thousands of miles apart! Nothing’s easy in this band. The song “Year Of The Blizard” is an interesting one. Not only does it have a very interesting title, at first I thought it was a metaphor or something, but it seems like it’s not. It’s also the longest one, and the beginning must be a homage to Jethro Tull? MJ: – This one is 100% Chris Black, but I think you’re right that it’s a serious tribute to 70s protometal in general, from Led Zeppelin to Rush to, yes, Jethro Tull. While recording, I always referred to that section as “The Aqualung part” even though the vocal melody is more closely related to “Locomotive Breath.” This was actually intended to the title track originally, but we dropped that idea when we couldn’t think of a good way to graphically capture the song in a way that also implied something about the other songs. It would have been cool to have a white cover, though! You have said that with PHARAOH you want to move melodic metal forward. Seems like quite a task. How is this possible? MJ: – By that I simply mean that we don’t just want to retread the glories of the 80s, or even the 90s. Melodic metal doesn’t begin and end with Iron Maiden, nor power metal with Helloween. I think melodic metal is in a serious slump these days. 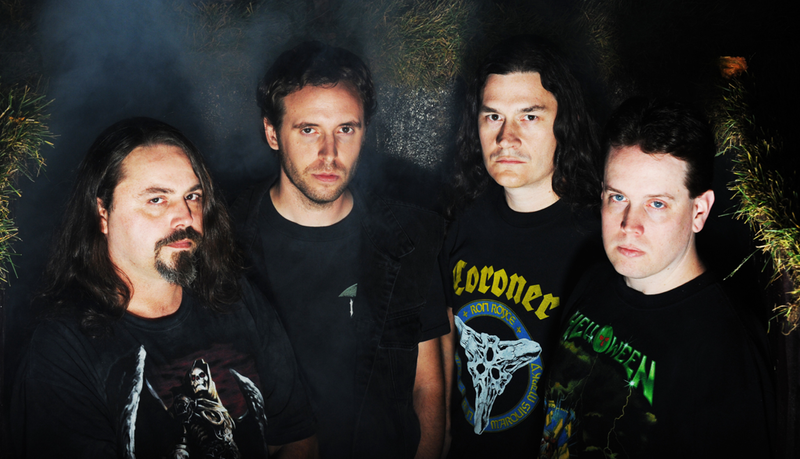 Even a great band like Solar Fragment basically sounds just like Blind Guardian. And while Blind Guardian themselves have finally refound their footing with their latest album, it’s pretty clear that their days as trailblazers are pretty much over. They have their sound, and they’re going to stick to it, making minor refinements here and there. Most of the other great bands in the power metal genre have also basically lost it. Gamma Ray is terrible, Helloween is foundering, Rage is treading water, even my beloved Angra are having a tough go of it. And there are precious few newer bands making any creative headway, either. Holy Grail is an exception, I think. They definitely have a powerful nostalgic undercurrent, but they also incorporate modern sounds and influences. Contrast Holy Grail with the related band White Wizzard. I enjoy White Wizzard quite a bit, but there is nothing original or new about them at all, and it’s hard to say how they’ve built upon the foundation laid by the greats of the good ol’ days. This is not to say that I think melodic metal or power metal or whatever you want to call it needs complete reinvention – it wouldn’t be power metal then! But, just as Angra updated Helloween, I hope PHARAOH can add to the legacy of the music we participate in. What can Pharaoh learn from Angra and the way they updated Helloween? Why were Angra successful at doing this in your opinion? MJ: – If you listen to “Angels Cry”, it’s basically Helloween plus a mountain of high-test musicianship (and a little bitof Yngwie.) It’s a great album, and catchy, but really it’s not THAT far removed from its inspirations (although if you compare it to, say, Viper, you can hear how Andre Matos’s style was evolving.) But with “Holy Land”, they took power metal into strange new places, with its Brazilian melodies and percussion, it’s masterful deployment of dynamics and textures, and the subtle technicality of the rhythm section. That album is jam packed with incredible guitar riffs, but the guitars don’t dominate the mix. It’s a really fascinating album, and especially when you consider what else was going on in the melodic metal scene, there was nothing like it at all. Sadly, they were never able to duplicate that success, but until the new album, and even on the backpedaling Rebirth, they always managed to incorporate new ideas into a fundamentally familiar power metal base. I’m afraid they feel too beholden to their fans, though, and are perhaps too risk averse since Andre left, and this is the trap we want to avoid falling into. It would be better to just call it a day for Pharaoh than to simply repeat ourselves because that’s what everyone is calling for. When I did an interview with you after the release of “Be Gone”, Chris talked about two songs that didn’t make it to that album. “Nothing I Can Say” ended up on “Ten Years”, but what about the other song he mentioned – “Behold And Believe”? Did it end up on “Ten Years” as well, but with another title maybe? MJ: – I’m not sure what song that was, but yeah, it did become something else. That might in fact have been the working title for “Ten Years,” but it’s been so long I can’t remember! I can say that there are no songs from the “Be Gone” sessions that haven’t by now been released. There isn’t a musty box with a 2” tape labeled “Behold and Believe” languishing in the Cruz del Sur warehouses, ha ha! Did you write songs this time, that didn’t make it to the album? How do you choose which songs make it to the album, and which don’t make it? I am asking, cause I feel that the songs from the “Be Gone”-session that ended up on “Ten Years” are just as strong as the songs that made it onto “Be Gone”. MJ: – There was one song recorded with “Bury the Light” that did not make the album. It was felt by a majority of the members that this one song wasn’t as strong as the rest, and also that including it would have made “Bury the Light” too long. We’re all of the belief that it’s quite possible to have “too much of a good thing,” and it’s rare that a great 55 minute album wouldn’t have been better if it was a song or two shorter. As for “Ten Years”, we realized long before we even recorded the album that we had too much material for a single release, so we conceived of the EP then and there. The song “Ten Years” was written specifically for the EP, and of course the covers were destined for the EP as well, but the other songs were picked for the album or the EP on a case by case basis, mainly on the grounds of their relationship to the emergent lyrical theme of “Be Gone”. When it became clear that Be Gone was holistically about “something,” then it was also clear that some of the songs we had written didn’t fit with the others. “When We Fly” is the best example of that. But then, “Nothing I Can Say” fit the theme perfectly, but we couldn’t imagine a running order for “Be Gone” that included that song without a tonal clash. So, it was forked to the EP. “Ten Years” was never meant as a “Be Gone” leftovers collection, in other words. On this new album there are songs written by band members alone, as well as songs that are collaborations. Do these two categories of songs differ from each other in any way? In other words, does a PHARAOH-song turn out different when it’s written by only one member of the band? MJ: – Absolutely, particularly when that one member is Chris Black! Songwriting in PHARAOH is fairly democratic, although it tends to follow relatively predictable paths. Most of Tim’s contributions are vocal melodies, for instance. He does write lyrics, too, but he’s only written guitar parts for one song, “Nothing I Can Say,” from “Ten Years”. I write considerably more guitar riffs than everyone else, but (generally) fewer lyrics. I write vocal melodies only under duress. Chris Black is particularly good at matching words to Tim’s melodies, and he’s an excellent lyricist. Kerns is the wildcard, as he usually writes complete songs on his own, but this time he elected to open all of his compositions to collaboration. The value in those rare songs written by a single member is that they tend to sound quite different from the ones that several guys created together, and this makes it a little easier to break up the sequence of the album so that the song don’t all run together in a homogenous soup. On the new album, I think the most striking example of this is the 1-2-3 punch of “Graveyard of Empires,” probably our most complex song to date, backed with “Burn With Me,” possibly the most straightforward, rocking PHARAOH song ever, followed by “In Your Hands,” the album’s catchiest tune, which combines the fairly distinct sensibilities of my riffing and Chris Black’s knack for vocal arrangements and lyrics. The new album is the first of your releases without a title song. Even the EP “Ten Years” had one! Just a coincidence, or is there another reason? Why have you chosen “Bury The Light” as the title, when there isn’t a song with that name? MJ: – As I mentioned, we originally meant to call the album “The Year of the Blizzard,” and in truth, this title was conceived during the recording of “Be Gone”! It would be years before the actual song was written to go with the title! But, when we decided that that song didn’t stand up as a single representative for the whole album, we also realized that none of the other titles worked in that capacity, either. It actually took us quite a while to come up with the right title for the album, because for any possible title we also had to think of a cover concept as well. We tried a lot of “Light” variations on for size, as light figures prominently in many of the lyrics as a symbolic concept, if not in the ways you’d traditionally expect. I believe it was Chris Black who came up with the title in the end, as is his wont. He’s definitely the Big Ideas man in the band. The cover concept emerged from the title pretty readily, and JP Fournier’s art, as always, delivers in spades. In the end, we feel the title works perfectly to sum up the songs and our feelings about the album. Thank you for such a thoughtful interview. It’s been a pleasure! This entry was posted in Long Distance Runners by leifkringen. Bookmark the permalink.